Press release: Catching mosquitoes like a pro: Scientists’ gold standard tiger mosquito trap available for home use. Home » Biogents Blog » Press release: Catching mosquitoes like a pro: Scientists’ gold standard tiger mosquito trap available for home use. Regensburg, Germany, April 3, 2019 - Scientists were thrilled when Biogents’ BG-Sentinel came out more than 10 years ago: finally, a mosquito trap that really catches yellow fever and tiger mosquitoes! It took not long, and the trap was the gold standard for mosquito pros in governmental organizations, the military, science, and mosquito control organizations worldwide. The unique design combines optical and physical cues with an artificial skin scent (BG-Sweetscent) to attract mosquitoes. And the trap now has a brother that is also available for home owners in the US: the BG-Mosquitaire is a rugged and good-looking version, designed for the continuous use in the garden and backyard. But do the two traps perform equally? A scientific study, just published in the open access Journal of the American Mosquito Control Association, compared the two trap types in California and Louisiana. The result: both traps are equally efficient. Photo: © 2018, Biogents AG. 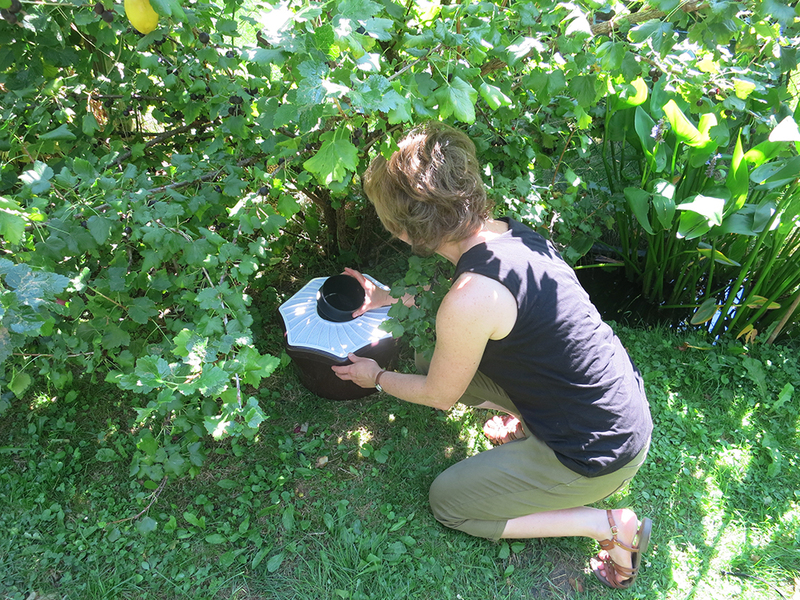 A home owner is inspecting the catch bag of a Biogents BG-Mosquitaire trap. This trap for home use is as good as scientists’ gold standard tiger mosquito trap, the BG-Sentinel. Mosquitoes? Not in my backyard! They are annoying and can make the outdoors miserable. But beyond that, they can also transmit diseases. The day-active Asian tiger mosquito and its closely related cousin, the yellow fever mosquito, are especially efficient disease vectors - they can carry West Nile fever, dengue, chikungunya, or Zika. And they are continuously spreading throughout the US. Biogents traps can help to control them – but are those offered to the home owner as good as the professional version? The new study suggests they are. “We showed that the BG-Mosquitaire is as good as the BG-Sentinel trap for catching yellow fever and also house mosquitoes. This means that a professional trap that has been recognized and used for more than a decade by mosquito experts is now available for the home owner.” says Dr. Scott W. Gordon, medical entomologist and the study’s main investigator. But not only that. Even without CO2, and only baited with the artificial skin scent, the BG-Mosquitaire outperformed, or was at least as good as, other mosquito traps that use propane-generated CO2 as an attractant. “CO2 is present in human breath and is a powerful attractant for mosquitoes”, says Dr. Gordon. The gas can be optionally added to the BG-Mosquitaire. By doing so, the trap’s catch rates for yellow fever and house mosquitoes increase up to 5-fold, and a wider range of other mosquito species is attracted. In comparison to two other trap types that use CO2, the BG-Mosquitaire collected at least 7 times more Asian tiger mosquitoes when it was also used with CO2. Please name the journal in any story you write. If you are writing for the web, please link to the article. All JAMCA articles are available free of charge (open access). Biogents AG is an innovative company on the forefront of mosquito control research and focuses on the development and production of highly efficient mosquito traps. Biogents traps are the latest innovation in mosquito control traps and incorporate patented technology. 17.04.2019 Boost your trap! How to get rid of Asian tiger mosquitoes more effectively.